Marvellous adventures creating images and pictures on a Brother 950i knitting machine, exploring alternatives to traditional yarns, and researching forgotten techniques. There are multiple digital copies available on the internet. The New York Library digitised copy via the Hathi Trust website: https://babel.hathitrust.org/cgi/pt?id=nyp.33433006773919;view=2up;seq=400 The recipe for the Opera Cap is on pages 375-8 in the New York Public Library edition. There is similarity to the illustration though if I tried to replicate the illustration without the recipe then the resulting cap would use a completely different recipe. 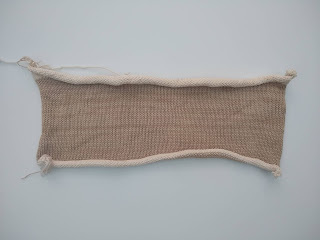 As with most Victorian knitting instructions there is an element of experimentation and knowledge expected. The instruction to hem the fancy edges created a yfk2tog picot trim that is common in patterns today, but not yet standard terminology back in 1843. 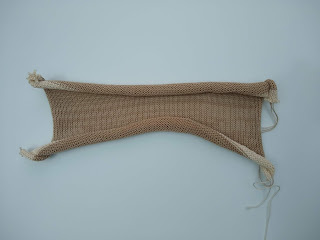 Here is a photo of the reverse of the edge showing the picot edge hem, the reverse of the lace pattern, and one of the braids attached to a corner. Keeping with the heritage of the project the yarn used is Cochno Farm wool available from the University of Glasgow shop. The wool was created as part of the University's Knitting in the round: hand-knitted textiles and the economies of craft in Scotland project. 4mm knitting needles (strictly speaking no. 10 is 3.5mm but used 4mm as that works best with the DK yarn I’m using). Double-knit wool – I’ve used 2 balls of 50g Cochno Farm wool in natural and pink. Make up the cap by folding over the edge at the yf2tog row and sew edge to body to make a picot-edge hem. Make up plaits or use ribbons and attach at the 4 corners. Place over the head and tie behind and under the chin. 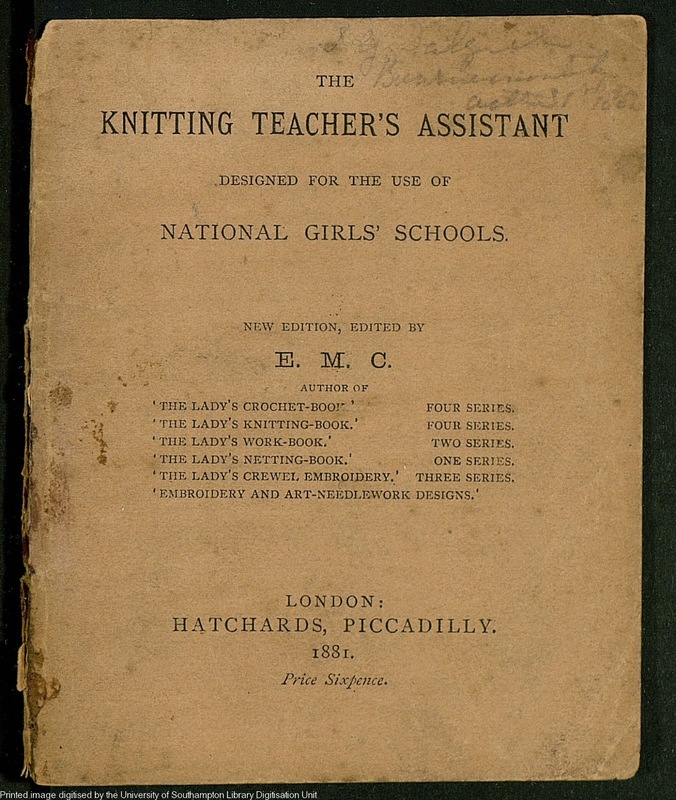 The Knitting Teacher's Assistant is a small 32 page booklet that was produced in the nineteenth century to aid teaching knitting in schools. 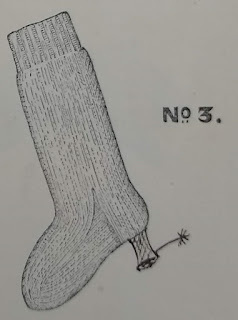 The booklet uses a question-and-answer dialogue to discuss all the instructions and actions required to complete a knitted sock. There is a table at the back of the booklet with multiple sock sizes with the required stitch count in order to achieve each size. The booklet was published by Hatchards, who have an archive, but haven't responded to my requests for information about when the booklet was printed and how many copies were produced. Therefore, the data is patchy, and based on copies that exist in libraries and archives that have been catalogued. The earliest copy that I have seen is a facsimile of an 1817 publication that was produced by Robin Stokes (sadly the website no longer exists). The added information page at the front of the copy noted that this was a facsimile of Robin's personal copy (location unknown). According to the library catalogue at the University of Melbourne, Australia, they have an 1819 edition. 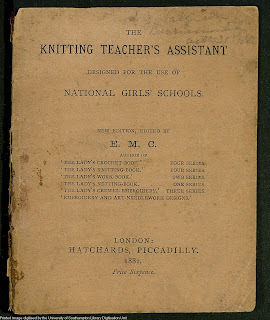 The University of Reading has an 1836 publication of the seventh edition of Knitting Teacher's Assistant in the Special Collections held at the Museum for English Rural Life in the Children's Collection. The British Library also has a copy with the same year and edition. The V&A Museum has what looks to be the same content, with the title The National Society's Instructions on Needlework and Knitting and it contains a knitted sampler. 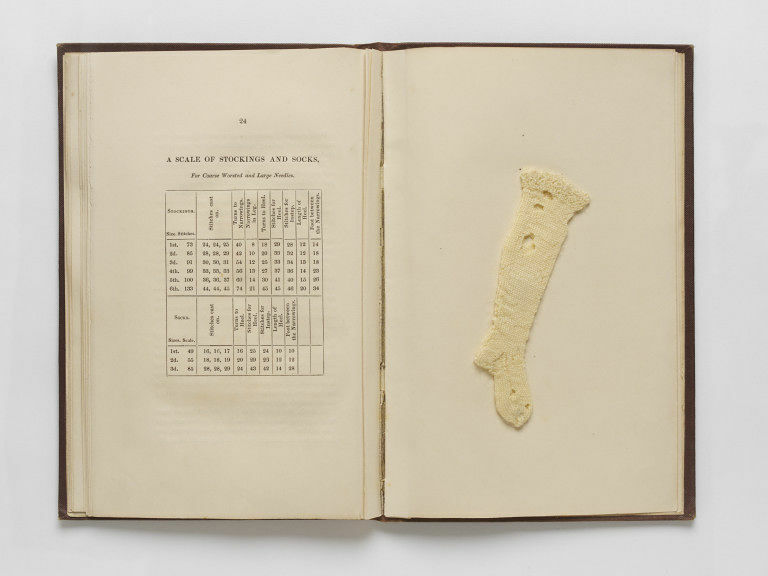 The summary suggests it 'was the first British publication of this type on knitting' but their copy is 1838 and second edition, whereas the University of Reading copy is 1836 and seventh edition. 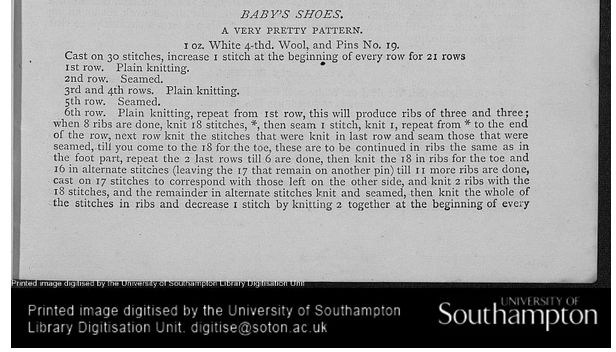 The Knitting Reference Library at the Winchester campus of the University of Southampton has an 1881 publication from Richard Rutt's collection which has been digitised and is available through Archive.org. If you know of any earlier copies, please leave a comment with the details. 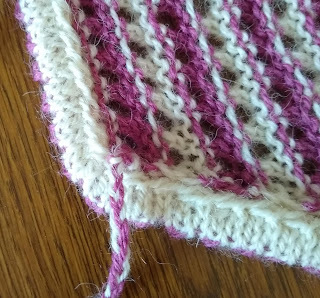 The most frequent question I get asked by new knitters is what they've done wrong. They pull a crumpled handful of knitting from their knitting bag and offer it for inspection. 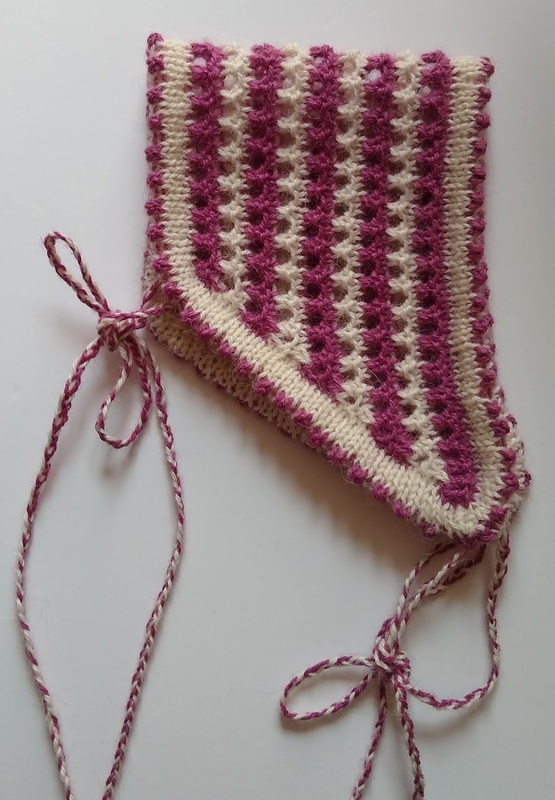 In every case, the knitter has carefully followed the instructions, and the piece of knitting they offer is as the pattern intended. The difference is that it doesn't look like the photo. In knitting books and magazines the instructions end with some vague reference to follow the instructions on the ball band. There is little or no detail of the blocking required, and with British written instructions there is often a lack of a diagram with measurements to block to. At least charted patterns usually include a diagram with measurements. My theory is that the knitter born since the 1970's lacked the inherited wisdom of watching parents knitting, washing, blockings and pressing knitting to create the finished fabric. The 'skipped generation' knitters often learn from magazines, videos, or knit-and-natter sessions. They see experienced knitters display their perfect finished garments that look just like the photo that accompanied the original pattern. The gap in knowledge of the unknown finishing tasks creates a gap in confidence. 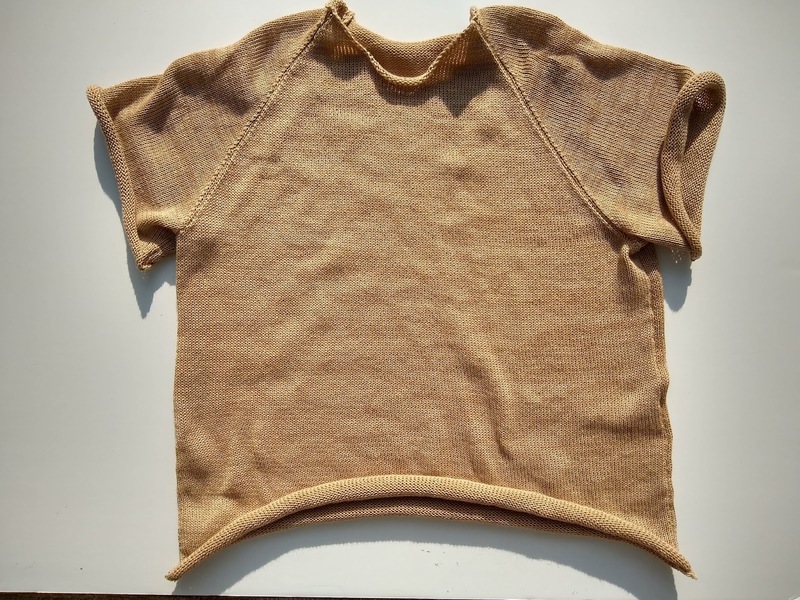 There is a lack of experience witnessing the casting off a piece of knitting, and observing the following work required to turn a curled piece of knitting into garment fabric, and the sewing-up that turns the fabric into a garment. Most knitters think of these activities as rather dull and uninteresting. The space and steam required makes this an activity difficult to being along to a knitting club or social knitting session. Sewing up is often a tv-watching activity, as it is a slow and time-consuming to match up markers and patterns, and ease seam allowances around shoulders and necklines. To try and mitigate the worry and concern, here are some photos that are all taken after various stages. 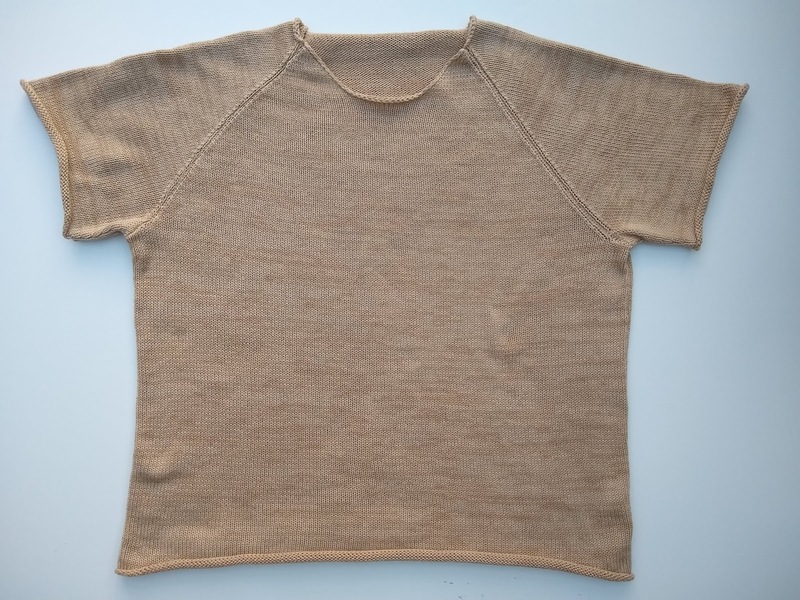 The following photographs are of a gauge swatch, and the resulting cotton machine-knit t-shirt. There is an element of treasure-hunting the unknown when cataloguing archive boxes. As each box is laid down on the reading room table, there is an air of expectation of the treasure that may lay within. That you may be the first person to look in this box since it was neatly put away on a shelf in the archives many years ago. I experienced this excitement cataloguing five boxes of archives in the John Johnson collection of printed ephemera held in the Bodleian library in Oxford. The collection absorbed the prior Constance Meade collection, and the boxes of fancy work and of knitting and crochet patterns were combined. A lack of funding, combined with the triviality often associated with knitting patterns ('trivial' was the word used by Potter in her bibliography), resulted in these five boxes not being catalogued up to now. As I have a research interest in the contents (studying a part-time MA in History), I took the decision to spend two days at the archive, rather than just one, so that I had the time to catalogue all the contents, and not just the contents relevant to my research. I'm currently in the process of reviewing and correcting my catalogue notes, and slowly submitting the details and photographers, box by box, to the collection, in the hope that they are of sufficient quality to be absorbed to the existing online catalogue, to aid future researchers. As with any cataloguing process, there are surprising and unexpected finds, as well as disappointments. I had hoped to find a pre-1820 copy of the 'Knitting Teacher's Assistant', but that was not to be. However, I did find sheets of metal, a puzzle label, postage, and plenty of doodling and marginalia. Here are a couple of examples found in 'The knitting and crochet workbook', 2nd edition, published by Thomsons Brothers (year unknown). There was also the satisfaction of reuniting a cover and title page located in box 6, that had been separated from the book contents in box 4. To clarify, I didn't do the reuniting myself. I followed the correct procedure and informed the Archivist on duty of my find in Box 6 that matched a book I had seen in Box 4 that was missing a cover, and it was the Archivist who did the actual re-uniting, and appropriate documentation. In the last blog post it was noted that reviewing knitting books from the nineteenth century was in progress. The review resulted in a successful application to study a part-time MA in History at the University of Reading to investigate the wider issues of gender, class, and socio-economics of knitting book publishing. Since starting the course, the research has widened to include all knitting books published prior to World War 1. Reading has, within the Special Collections hosted at the Museum for English Rural Life (MERL), several copies of texts from this period. Reading also has strong research experience with gender history, book publishing history, corpus linguistics, and printed ephemera, including recent collaboration with the John Johnson collection at the Bodleian. Having analysed Esther Potter's bibliography and Richard Rutt's 'A History of Hand Knitting', I was frustrated with the lack of biographical information sufficient to obtain a clear view of the class and socio-economic status of the author Miss Frances Lambert, who was one of the earliest successful authors of knitting, crochet and needlework books. A thorough biographical research project was initiated, which is 80% complete. 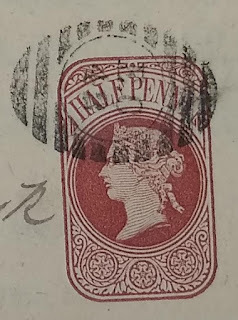 Sufficient evidence has been collated to confirm when Miss Frances Lambert was born, when she married John Bell Sedgwick (a bedell at The Royal College of Physicians), and the addresses lived at between the marriage, and her death in her 80's. Corrections were submitted to the British Library Catalogue, as some entries had incorrectly been attributed to Miss A Lambert. A full biography is in progress, with anticipation of submission to the Oxford Dictionary of National Biography, which currently lacks biographies of female writers in the nineteenth century. I have catalogued five archive boxes held in the John Johnson collection at the Bodleian in Oxford. The John Johnson collection absorbed the contents of the Constance Meade collection that is referenced by Potter. The fancy work boxes had yet to be catalogued. The contents have now been logged and photographed, and will be submitted for consideration to be absorbed into the existing online catalogue, to aid future researchers. The 'In The Loop 2018' conference is taking place at the Winchester School of Art this week. The conference programme is available on the 'In The Loop' website. After taking a break from my knitting experiments and research for 18 months, due to a seriously ill member of the family, the knitting machine and Victorian books have been dusted off. In a boost to getting back on track, there was extensive use of mind-maps to identify what I have achieved, and what directions to head off in. Miss Lambert's books are at the top of the list. Luckily, Miss Lambert's books were published by John Murray Publishers, who still exist today. The archives of the last 200 years of this fascinating company are now held at the National Library of Scotland. The staff are very helpful and knowledgeable, and they provide a digitisation service for researchers unable to make it to the archives themselves. The initial analysis of the original accounting logs shows that the imprints of Miss Lambert's books ramp-up quickly, and provided income. The initials "F.S." in the preface of one of Miss Lambert's books seems to have been a bit of a red-herring. 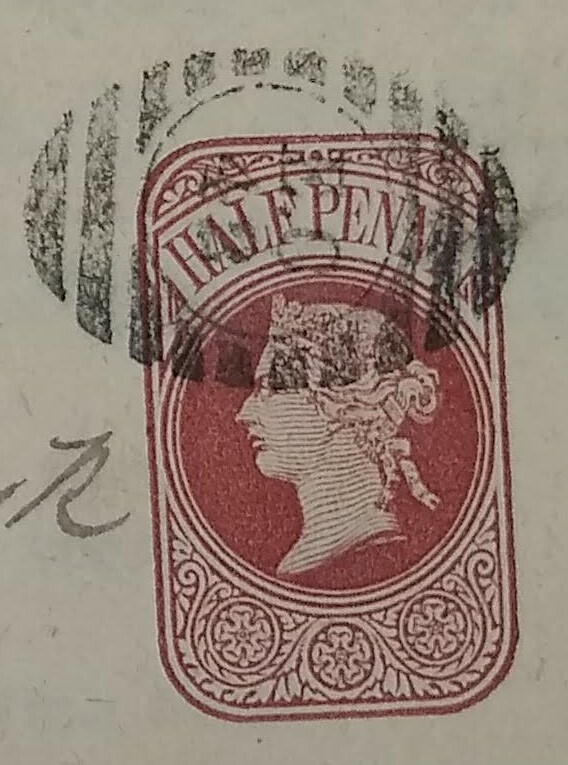 Research at the London Metropolitan Archives has confirmed entries in the Thompson's business directory, and the Post Office business directory, which I am working through. Rather surprisingly, the census entries for the addresses found in the business directories don't directly link up, providing more questions than answers. A trip to the archives at Kew is planned, to try to resolve some of these loose ends. The results so far will be written up as a research poster to display at the Knitting History Forum and conference in November. On a more technical front, I'm working on 3D-printing replacements parts for my knitting machine, and intend on writing up a brief article for the Machine Knitting Guild newsletter on the subject, with a detailed blog post to follow. 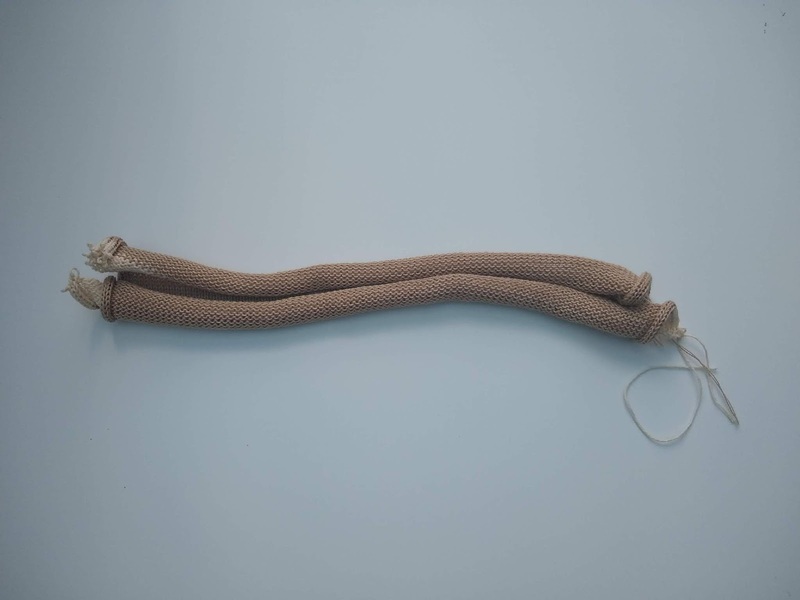 The Knitting Reference Library at Southampton University has digitised 67 pre-1900 books from the Richard Rutt collection (books that are out of copyright). This is a wonderful resource of a wide range of knitting recipes, advice, guidance, and social history. The instructions to knit a garment are referred to as recipes, which in current parlance we refer to as patterns. The use of the term pattern seems to infer colour patterns and the yarns used, rather than how to make the garment. There is a lack of drawings or images of the finished items, and no gauges. 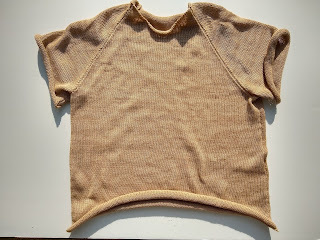 In a few cases there are instructions to knit for a certain distance, but other than that, no finished garment sizes are provided, and certainly no details for creating the garments in multiple sizes. After some research at the Knitting Reference Library in Winchester, and some looking-up of standard wire gauge measurements, the nearest modern needle size I could find to Victorian No. 19 pins are 1mm DPNs. Not easily available. Most knitting shops only go down to 2mm needles for very fine lace knitting or socks. Luckily for me, the Knitter's Pride Karbonz go down to 1mm (US 00000), and were available by mail order. 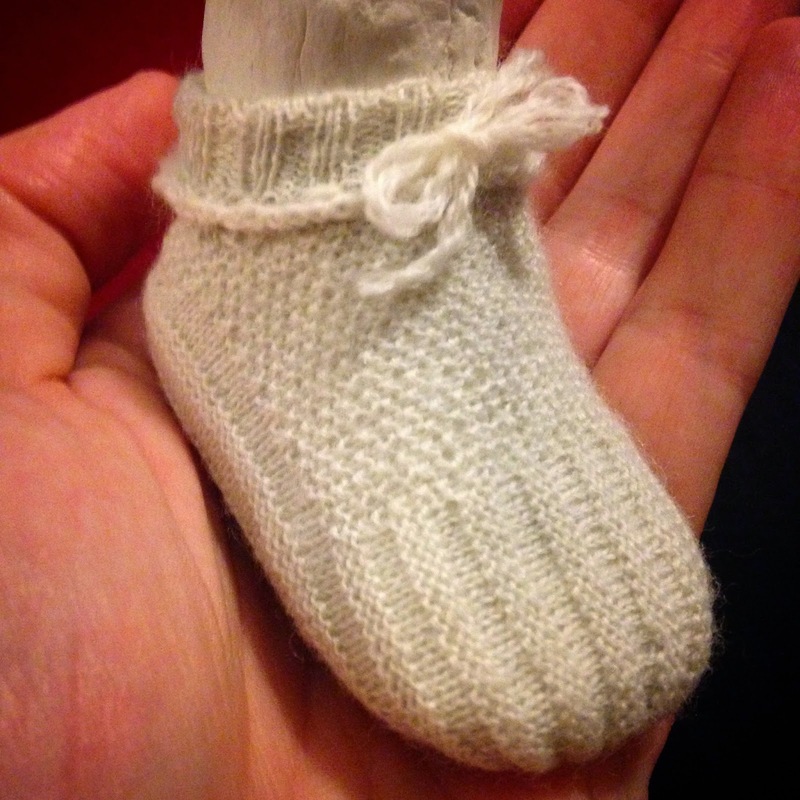 Whilst waiting for the 1mm DPNs to arrive, I had a go using 1.75mm DPNs (the smallest I had in stock) and some 2 ply wool from my stash and I produced the first version of the baby shoes. They came out about the size of a 3 year old's foot. For the second attempt I used 1mm DPNs and Yeoman Yarn's 1 ply merino wool that I had left over from making a Zandra Rhodes machine knit circular jacket. 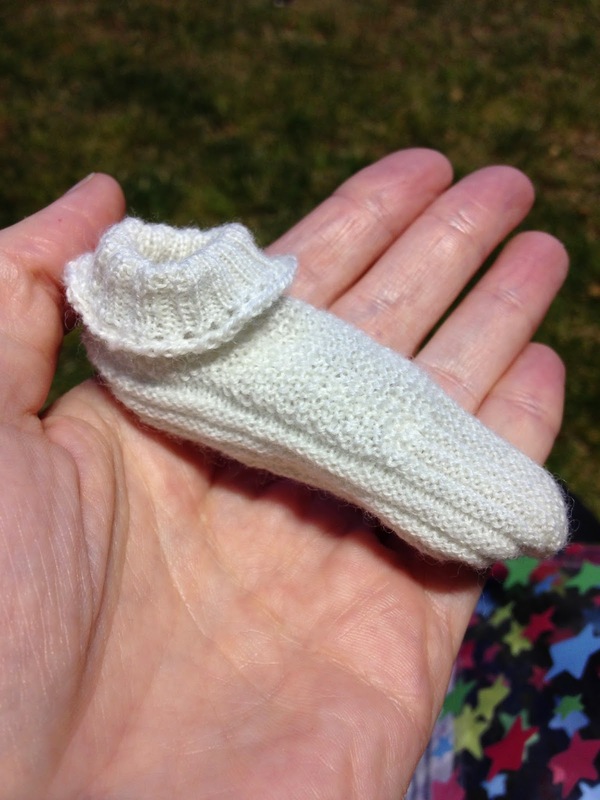 This one seemed to come out about the right size, though several friends with babies commented that the size is at the smaller end of baby feet, but suggested perhaps Victorian babies were (on average) smaller than today. 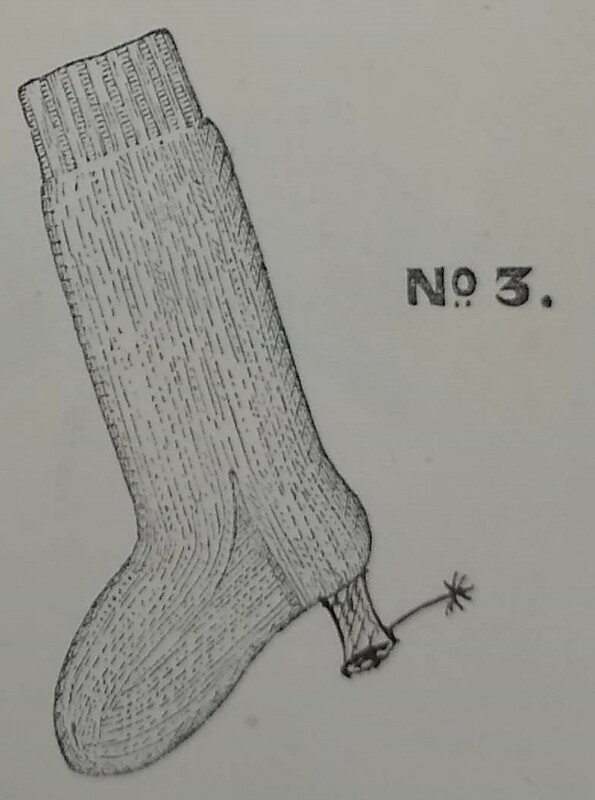 The Victorian knitting recipes certainly assume a much higher level of knitting ability from the reader, and in some places are more of a guide than instructions. The finished shoes certainly received warm praise and lots of "ooohs" from the members of the Knitting History Forum at the annual conference last month. Hand knitting and machine knitting.